No. For reals, you guys. I REALLY REALLY REALLY love yellow and grey together. It is just SUCH a gorgeous combination! It makes me happy. Just say'n. That being said, when my Scrapbook Circle Remember This kit arrived containing these GORGEOUS papers...I was a tad wee bit excited. Just a bit. I mean a little. If by a little you mean LOTS AND LOTS AND LOTS!!!!! *SWOON!!!! * The Polaroid frame is cut from another fabulous sheet of patterned paper in the kit and then I embellished with a little banner made from the MME Button Card and twine...again...ALL in the kit! Seriously, you guys...this kit ROCKS! So far I have made SIX, count 'em, SIX cards with it - adding ONLY white cardstock, and I have TONS AND TONS of stuff left to make more! And I will...trust me on this one!!! The little sentiment tag came from the October Afternoon Flour Sack (Farmhouse collection). I LOVE this flour sack! So many fabulous die cuts and they coordinate wonderfully with the kit papers! YAY! Remember This Kits are still available and ready to ship and the best part is...if you want, you can subscribe to get a kit every month OR you can simply purchase ONE kit because you love it! I am jumping right ON the yellow-and-grey bandwagon! I ALSO love RED-and-grey! Yeppers! I DO! Your cards rock! Every single time I think I MAY be able to make a semi-presentable card, I think of your FABULOUS cards & decide to leave the card making to you EXPERTS. I'll stick to crocheting, counted cross stitching & making my crazy creations. LOL! I adore the color combo! It is the colors of my daughters first bday in fact! Great job! I really love yellow but I hardly use it! Your card is adorable! Jingle, you have me wishing my kit was here! I am still waiting on the postlady. Love the card, but I am very partial to yellow and gray. The inside of my house is painted light gray with two toned yellow in my kitchen. It feels so sunny and warm in the kitchen. I love it! 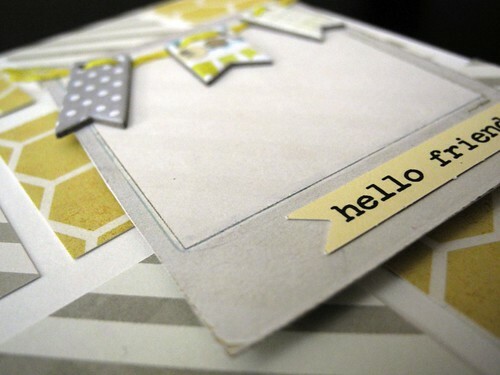 I love that color combo too--looks like an awesome kit to get and your card turned out fab. Love what you are doing with the SC kit! I am swooning over this one, too! Love this card. I so want one of those polaroid dies, and I love how geometric this is...not just the design, but the papers too. I agree that yellow and gray are a fabulous combo!! Too cute! I'm a big fan of yellow and had never thought of pairing it with gray. Must say it looks quite nice!!! I agree..yellow and grey look great together. Nice card. Love the bunting. I love that color combo too! Your work is amazing! Great color combination! Love the cards! Have a fun weekend! I also reallly love grey and yellow. I keep pinning grey and yellow decor for a nursery for my future (and not conceived) baby. LOL . Love the card! I too am in love with those color combos right now. Your card is gorgeous. Very cool! The panel with the pennants really gives this fab grid card even more pizzazz! I love yellow and grey as well! The Teresa Collins Carolina Breeze is my current fave for this color scheme....it's so so fun! You do have the eye when it comes to color matches. Yellow and gray look great together. I LOVE the card with the bicycle..I like any card that can be used for a boy and that so could. LOVE YOUR CARDS! great work! and this bicycle is just soo sweet! So fun, Jingle! Love the yellow and grey together! This is awesome! You make simple special! I love the yellow and grey too! I've always avoided yellow because it was usually paired with black (making everything look like a bumble bee). I do love yellow and grey... guess what its my husbands fav too! LOL.